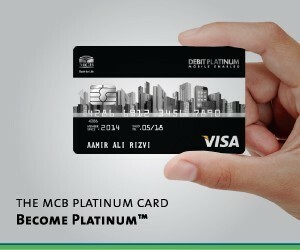 Welcome to the world of MCB VISA Debit Platinum. The card that’s built around unmatched convenience with enhanced security and round-the-clock accessibility to your funds in Pakistan and from around the world. Matching the persona and lifestyle of high-net-worth customers, the VISA Debit Platinum card is a status symbol. Its elegant product packaging, dedicated services and complimentary benefits ensure that you feel privileged! Together with world class services and features, you can now enjoy the best that life has to offer in a truly deserving way. MCB VISA Debit Platinum Card is accepted at millions of merchant locations nationwide/worldwide with shopping limit of PKR 500,000 per day. Be it shopping at popular retail outlets, relaxing at a spa, having fun with friends and family or dining out at the finest restaurants, benefit from gratifying discounts offered on your MCB VISA Debit Platinum Card.